For a hard-wearing tough quick recovering grass for your back yard or sports field you can’t go past OZTUFF®. This fine leaf Couch with a great dark green natural colour is ideally suited for domestic lawns, commercial areas, parks and both community and elite sporting fields. And, independent scientific testing* has shown that the Australian-bred Couch is Number 1 for wear tolerance due to its strong root development which leads it to having first-rate tear-capabilities and fast recovery. This makes it ideal for the rough and tumble of both kids and pets! 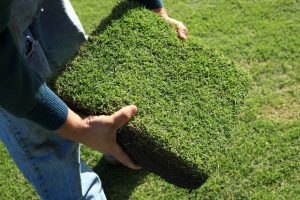 OZTUFF® is known as “the lawn that can take care of itself” and is suitable for all growing environments along the eastern seaboard from Brisbane down to Melbourne. It also performs well under different environmental pressures and recovers faster following periods of drought stress – a key climate factor now seen in Australia. *Nationally funded HAL (Horticulture Australia Limited) research projects: TU02005, TU06006, TU06008, TU08018 and TU09001.